So how low can you go? When it comes time to visit Death Valley National Park, the answer is pretty low indeed. Down 282 feet below sea level, Badwater Basin is the lowest point in North America. The extreme depth of the bottom of Death Valley and neighboring Panamint Valley (also a part of the park) stands in stark contrast to the jagged mountain ranges that frame these flat desert floors. The high mountain ranges, low valleys and searing temperatures mean that Death Valley is one of the most untouched places left on the continent. Its isolation makes it an ideal spot for Dark Skies stellar observation. Likewise, when the rains do come, they are often in the form of huge cloudbursts that produce raging floods followed by explosions of vast fields of wildflowers. 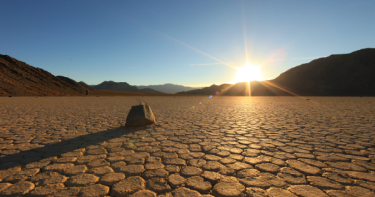 For getting away from it all and experiencing some of the greatest spectacles that nature has to offer in the form of rare geophysical and wildlife displays, Death Valley National Park is a pretty hard place to beat. Of course any confined desert environment is likely to produce that most typical of all desert environments: sand dunes. In fact, tens and even hundreds of millions of people have vicariously visited the sand dunes of Death Valley the first time they ever journeyed to that galaxy far, far away. The dune-swept portions of Death Valley served as the setting for the desert planet Tatooine in the first episode of the Star Wars movie franchise. Due to the practically life-threatening weather in the summer, most RV and camping facilities on the floor of the valley are closed during the summer, with the exception of the flagship Furnace Creek Campground. This 136-site facility offers all of the usual amenities. Summer stays are first-come-first-served during the hot months but reservations are available during the cool season from October to April. Primitive high desert campsites are also scattered around the park for those who truly want to get away from it all. Campsites at the higher elevations of the park are open either year round or from Spring to November for the ones at the highest elevations. In addition, many private resorts and campgrounds encircle the boundaries of the park itself. While many individual campgrounds may be filled on any given night, there is usually someplace to camp in the area at all times. In addition, there are many other attractions in the area, such as the civilized pleasures found in nearby Las Vegas. It is this series of very sharp contrasts that make Death Valley such a unique place. Few places on earth combine such a broad display of geography, climate, and history all in a single locale.